Request a Free 30 MINUTE CD! Learn about the controlling factors that affect your workers' compensation premiums. DOES YOUR CURRENT INSURANCE AGENT KNOW ABOUT THE INDUSTRY SECRETS - DO THEY EVEN CARE? We'll guide you — and reduce your insurance costs. 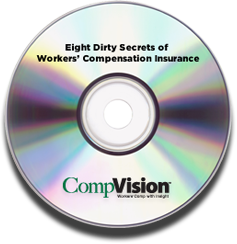 There are many contributing factors to your workers' compensation costs. Many businesses AND INSURANCE AGENTS are not familiar with these issues. Understanding, controlling, and implementing a process to control these factors are the keys to reducing your costs.